By industry, specialty trade contractors (2.8 million) accounted for almost half of employment in construction and extraction occupations. An additional 26 percent of employment was in construction of buildings (915,340) and heavy and civil engineering construction (574,960). Local government (330,490) was the industry with the highest employment of construction and extraction occupations outside of the construction sector. The 203,000 construction job openings in April 2017 represents an eight-fold increase from the same month in 2009. The biggest shortage is in concrete workers, millwork, masonry, electrical and plumbing round out the top five skilled jobs contractors are struggling to hire. There are more than 225 REITs in the U.S. registered with the SEC that trade on one of the major stock exchanges—the majority on the NYSE. These REITs have a combined equity market capitalization of more than $1 trillion. Fifty-nine percent of Certified Property Managers approved for Institute of Real Estate Management (IREM) membership in 2017 were women. Additionally, 71% of IREM Accredited Residential Manager memberships approved in 2017 were women. Read more about IREM’s diversity initiatives. Growth in building size outpaces increases in building stock. Between the first Commercial Buildings Energy Consumption Survey (CBECS) (conducted in 1979) and the latest 2012 CBECS, the number of commercial buildings in the United States has increased from 3.8 million to 5.6 million, and the amount of commercial floorspace has increased from 51 billion to 87 billion square feet. A growing population has led to a need for more buildings, and the changing needs and wants of consumers has led to larger buildings. The commercial building stock is middle-aged, and newer buildings are larger than older ones. Commercial buildings remain in use for many decades. Although about 12% of commercial buildings were built since 2003, the commercial building stock is still fairly old, with about half of all buildings constructed before 1980; the median age of buildings in 2012 was 32 years. However, in the existing building stock, the newest buildings outnumber the oldest; there are more buildings built in the 2000s than buildings built prior to 1946. Building size has outpaced the growth in the number of buildings over the past decade, according to the Commercial Buildings Energy Consumption Survey (CBECS). CBECS estimates that there were 5.6 million commercial buildings in the United States in 2012, comprising 87 billion square feet of floorspace. This level represents a 14% increase in the number of buildings and a 21% increase in floorspace since 2003, the last year for which CBECS results are available. Between April 2016 and March 2017, foreign buyers and recent immigrants purchased $153 billion in residential property. This is an increase of 49% from 2016’s $102.6 billion, and surpasses 2015’s $103.9 billion as the new survey high. Over 365,000 apartments were delivered in 2017, and large deliveries are expected to continue in 2018. Despite these strong levels, many key markets such as Houston and New York have seen demand exceed new supply over the past 12 months. As of June 30, 2014, the number of active real estate appraisers in the U.S. stood at 80,500. Preconstruction manager and construction superintendent are among the top ten best jobs of 2018, according to employment search engine Indeed. Based on salary—jobs with a baseline salary of at least $75,000. Careers in construction are on the rise. Population growth of people of color in the United States has outpaced that of white Americans for the past two decades, and by 2043 the U.S. Census Bureau projects the nation to become a majority-minority nation. Real estate organizations are addressing the need for diversity and inclusion and have strategic initiatives to attract new talent to all professions within the real estate industry. 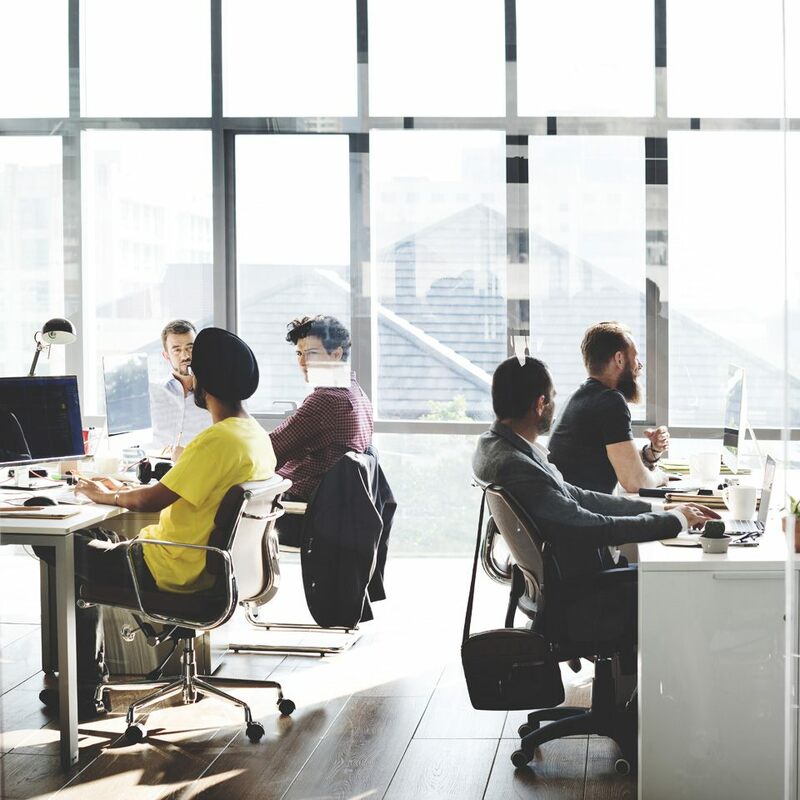 Commercial property types including nearly 10.5 billion square feet of U.S. office space supports 1.7 million jobs and contributes $234.9 billion to the U.S. Gross Domestic Product. Over the past two decades, women have achieved tremendous inroads in commercial real estate. For example, in 1984, only about 100 Certified Commercial Investment Members (CCIM) were women. Among today’s CCIMs, more than 550, or about 13%, are women. More women are stepping into leadership positions in a number of industry organizations. The number of people employed as Construction Managers has been growing at a rate of 2.58%, from 494,048people in 2014 to 506,818 people in 2015. The demand for construction managers is projected to grow 6.5% over the next ten years. Americans spend 87% of their time indoors and an additional 6% in an enclosed vehicle (on average). Design and building professionals are redesigning interior spaces, buildings, and communities to create healthier environments for the occupants. According to a recent AAAsurvey, more than one-third of Americans (35 percent) are planning to take a vacation of 50 miles or more away from home involving two or more immediate family members this year. The resort and hospitality industry will continue to strategize on ways to attract a growing audience. There are roughly $142 billion to $163 billion in e-commerce sales mostly resulting from the online channels of brick and-mortar establishments! A significant portion of the Census Bureau’s e-commerce sales figures are generated from brick-and-mortar retailers via their online channels. The complexion of the traditional shopping center is changing. A focus on food, beverage and entertainment are just a few ways to increase dwell time and keep the consumers engaged. London has assumed first place as the number one global city for foreign real estate investments. For the first time, Los Angeles has tied New York as the number one city in the US, according to the results of a new survey taken among the members of the Association of Foreign Investors in Real Estate (AFIRE). More than 200,000 U.S. service members are expected to transition into civilian life this year and in each of the next several years. As military personnel continue to transition out of active duty, the real estate industry offers diverse career opportunities. Almost half of all Certified Property Managers (CPM) work for organizations that employ less than 250 people. Approximately 11% of CPMs are self-employed. Although most property managers manage several different types of property, 32% of Certified Property Managers specialize in office buildings. Property managers with college degrees or graduate degrees earn more than those with only a high school diploma or some college experience. The average compensation of a Certified Property Manager with a bachelor’s degree was $116,304 in 2016. Apartments and their residents contribute more than $3.5 billion to the economy every day and almost $1.3 trillion each year. The United States needs 4.6m new apartments by 2030 just to meet the demand for new renters. The number of renters has reached an all-time high, with nearly 39 million people in the United States – that is almost 1 in 8 people living in apartments. Forty-three percent of workers in America do some telecommuting, according to Gallup. The same survey found that 37 percent would switch jobs if they could work offsite. On the flip side, the number of companies offering telework options has tripled from 20 percent to 60 percent, since 1996. Consumers are sharing everything…from rides to bikes to wi-fi to spare bedrooms. Statista reports that the number of adults who use sharing – economy services is expected to grow from 56.5 billon in 2017 to 86.5 billion in 2021. As of December 31, 2017, there were 82,208 active real estate appraisers. Almost 10% of the U.S. real estate appraisers held a license or certification in one or more states outside their home state. The proportion has increased steadily over the past five years. Seventy-seven percent of Real Estate and Construction respondents agree or strongly agree that their jobs will change considerably over the next three to five years as a result of digital business trends. Commercial real estate is financed with more than $3 trillion in mortgage debt. Banks are the largest source of commercial mortgage financing, followed by government sponsored enterprises (Fannie Mae and Freddie Mac), the commercial mortgage backed securities (CMBS) market, life insurance companies, mortgage REITs and others. Apartment properties accounted for the largest share of mortgage financing in 2017, followed by office buildings, retail properties, hotel/motel, industrial and health care. 2017 saw a record level of borrowing and lending backed by income-producing properties. The average size of loans made by mortgage bankers in 2017 was $17 million.